OWH Stars and Stamps (Our OLD blog! 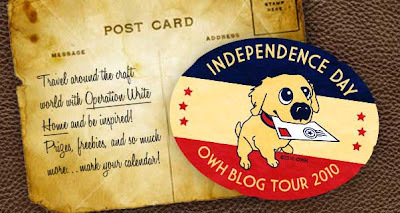 ): Blog Tour! By popular demand, we're going to hold an online event for Independence Day! You may have seen our webpage all about it here. GAMES! We're planning a few fun games that will take place on our new Forum....some might be word games, "questions" to answer, scavenger hunts....who knows! Feel free to make your own suggestions on the forum in the next 10 days - look under the blog section for the Blog Tour Brainstorm thread. CHALLENGES! For those with some inky time on their hands....we'll be having some timed challenges, so check in regularly on the Forum and Facebook for updates! You may only have 2 hours to complete and post a card to enter for a prize! DIGI RELEASE! We're working on a new set of fun digis...if you'd like a preview so you can use some for your tour card, watch the Forum for info when the digis are available. Check out the Blog Tour page for more details, and feel free to post on your blog about the big event to help get the word out. Wouldn't it be great to have lots of people participating! Sounds like everything is coming along nicely, Sandy, let me know if I can do anything to help out on "tour day". I would be happy to help out with challenges, games, or whatever you need. When I get some stuff ready, I'll be emailing some of you about helping with the scavenger hunt idea - anyone got a few hundred extra hours hiding somewhere that you can share with me? lol. I would love to help with the scavenger hunt or other games.